Count Basie and Jackie Wilson cover Jerry Butler's "For Your Precious Love". A little over a year ago, I posted a clip of Count Basie and Jackie Wilson, great jazz and R&B artists, respectively, doing the Stevie Wonder Motown classic "Uptight". Unfortunately, that video clip is no longer available, but I was glad to find the clip above, evidently from the same recording series, of Jackie and the Count covering what, in my opinion, is one of the best R&B ballads ever, "For Your Precious Love". Here's the original, by Jerry "The Ice Man" Butler. Much as I'm a fan of both Basie and Wilson, I still prefer Butler's understated yet emotionally intense delivery of this song, with its subtle accompaniment: guitar, bass, very quiet snare, and soft harmony vocals. Still it's good to have both. What do you think? You may have noticed, as I just did, that certain words in my posts are being highlighted--not the ones I've highlighted as links--and that, when you mouse over these words, ads pop up. I didn't, at least not knowingly, authorize this, and I'm trying to find out how to get rid of it. Sorry for the distraction. Update: It seems the problem was an extension, which I never knowingly added, to my Chrome browser, called Text-Enhance. Unless you had this on your browser, you wouldn't have seen the highlighted and underlined words (links that I put in are highlighted but not underlined) in my blog posts, and wouldn't get the pop-up ads. If you are seeing these things on my blog or on any website you visit, follow these directions to get rid of the malware that has attached itself to your browser. When you see the list of extensions on your browser, it may not include Text-Enhance, but it may show as DealPly. I hasten to add: there is no malware in this blog, and visiting it is perfectly safe. Santana sits 'em down for the Mets. It only took them fifty seasons, but the Mets finally got a no-hitter. 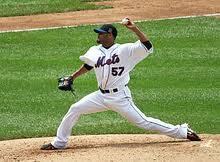 They got it off the arm of their ace, Johan Santana, who has had a rocky start this season coming off shoulder surgery. The eight runs scored by Santana's teammates called into question the notion that he doesn't get run support. That he and the team got it against the Cardinals, a strong contender in the NL Central, makes it doubly impressive. Typically for the Mets, it wasn't without drama. Santana came within inches of losing it in the sixth, when a long drive down the left field line was, in what I'm sure in the eyes of most Cards fans was an example of "home cooking", called foul. That the drive came off the bat of Carlos Beltran, who subsequently grounded out, casts doubt on the "curse of the ex-Met" theory. Photo: Wikipedia. I had the pleasure of taking in a performance by Doc Watson some years ago in Damrosch Park at Lincoln Center. Doc died today at 89, not long after another titan of the traditional country scene, Earl Scruggs, with whom Doc sometimes performed. In the clip above, thanks to Stefan Grossman's Guitar Workshop, he does "Tennessee Stud", a song I first heard him perform on Will the Circle Be Unbroken. Dewey & LeBoeuf: the inevitable happens. Even as [post-merger] Dewey’s performance flagged, the firm doled out lavish multiyear, multimillion-dollar guarantees to its top partners and star recruits. The guarantees — there were about 100, with several over $5 million a year — created compensation obligations that the firm could not meet. That what should have been evidently risky behavior continued after financial market turmoil, along with other, more gradual changes in the market for legal services, such as the tendency of corporations to take more legal work in-house to save costs, reduced the firm's revenue, points to a parallel between Dewey and J.P Morgan Chase. In both instances, there seems to have been a tendency to "double down" rather than to accept what may have been a manageable loss. I'll be writing more about the J.P. Morgan debacle soon. This is not the promised second installment of my reminiscences about the LeBoeuf that was. That we be along soon; I hope by this coming weekend. Please stay tuned.